A pair of biomedical experiments are wrapping up today aboard the International Space Station as the Expedition 58 crew began its weekend. The orbital residents are also filming a virtual reality (VR) experience and working on plumbing and life support hardware. Anne McClain of NASA removed sensors from her head and chest this morning that collected data about her circadian rhythm, or “biological clock,” and how it is adapting off Earth. Canadian Space Agency astronaut David Saint-Jacques stowed the wearable Bio-Monitor hardware that monitors an astronaut’s vital signs during normal activities with minimum interference. McClain then set up a VR camera to film a first-person’s view aboard the orbital lab in an immersive, cinematic experience. 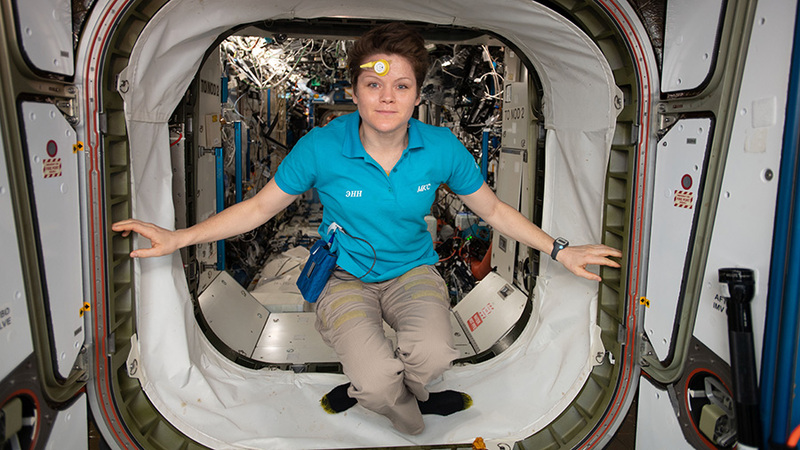 She finished the workday with Saint-Jacques on orbital plumbing work in the Tranquility module. The Combustion Integrated Rack received more attention today as Saint-Jacques replaced hardware in the fuel and flame research platform. He also assisted McClain with the VR camera installation, set up audio equipment and filmed an introduction. Commander Oleg Kononenko also up video gear today in Japan’s Kibo lab module and held a conference with Russian students and educators. The veteran cosmonaut then spent part of the afternoon conducting maintenance on life support equipment in the station’s Russian segment.